Fit-Ink: Fit-Pic: Swimming or Surfing? Whitecaps? Really? 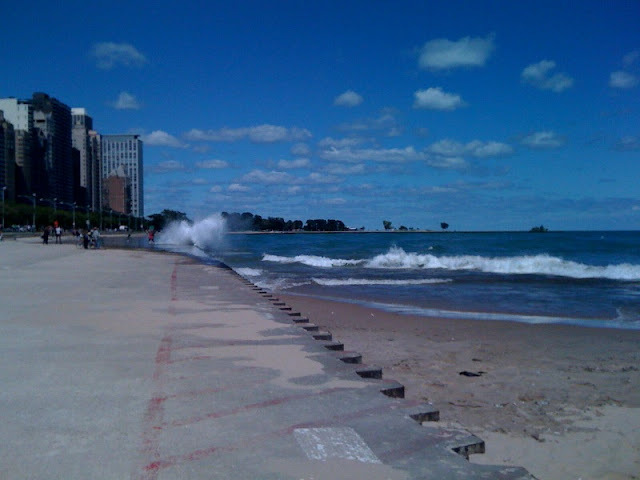 I know I live in the Windy City, but sometimes even the best of us know when to stay out of the water. Take today, where the wind is just too much and it's looking more like December than early September (minus the blue sky and sun). Thanks Wind, you spoiled my swim for the day. No way I wanted to slosh around in that for two miles. And apparently, no one wanted to sit on the beach in these less-than-perfect conditions: It was empty too. But that only means there's more room for my beach blanket. Or that I needed to borrow my husband's surf board and ride the waves. p.s. This photo is just yards from my home! Are we neighbors? Yes, we must be neighbors. I go to this beach a lot, especially if I want to skip swimming and just lounge :) I'll talk to you offline soon! And thanks for the comment!